A story in the Times-Picayune tells the sad tale of the death of yet another benevolent giant live oak in Louisiana. This time, it was a revered tree in Old Mandeville, killed by the usual suspect–humans. Yet the writer and the so-called expert got it all wrong. This tree did not die a natural death, it was a slow-motion murder by pavement and development. It didn’t have to happen, and it doesn’t have to continue to happen, but it will. We lack the common sense to be responsible stewards of our landscape. To some, this isn’t a big deal. But the fact is, we will die if we continue to fail to address our ignorance. That tree is just one of thousands of ancient oaks lost to development. In too many cases, “tree coffins,” those concrete boxes in the sidewalk or parking lot in which we expect trees to “live” are ultimately the cause of their deaths. You see it everywhere, from downtown streets to mall lots, older trees getting scraggly and dying in these small set-asides. It’s just plain stupid. I’d love to do a documentary on this subject if anyone out there is interested in helping. It’s long overdue. It is clear that development under the canopy is what killed that tree. To have a concrete curb within mere feet of the trunk means that the root system was damaged, ripped up and smothered by paving. The number one cause of the death of urban trees is soil compaction. Older trees, that grew without interference for decades, are particularly sensitive to disturbance of their root zones. Think of a tree as a closed system where the roots recycle the fallen leaves and act like both lungs and intestines, processing nutrients, water and air in a metabolic system. Then imagine machines, shovels, people, digging, covering, and sealing this system. It often takes decades for these trees to die. Look at the large trees in Old Metairie, surrounded by pavement. They are spindly, which means the tree is shutting down branch systems in its attempts to adjust. Trees are like submarines or ships with watertight doors that close to protect the rest of the vessel. When you see dead branches, those branches are shut down and will not become leafy again. That tree in Old Mandeville was murdered by progress. It died a slow and public death. It did not die of old age. It died of ignorance, neglect, and by the assault of human development. The good news is that we know better and can do better. But it is too late for many of these sentient giants in whose branches we can sense the touch of the divine. Older trees need and deserve protection and that means public policies that honor their roles in the health and wellbeing of the land that supports and nurtures us. We need to give older trees space. The top 18 inches of soil where most of the life-giving aspects of biology give rise to not only trees, but us. We need to understand that soil is alive and that trees–and humans–need healthy, loose, alive soil if we are to thrive. Guidry is wrong. It was somebody’s fault, a very long time ago, when they failed to care about the space that tree needed, and put concrete and pavement over its roots, and began a process of starvation and strangulation that weakened it and caused it to die sooner than it should have. We killed this tree, probably generations ago, when we built the roads and sidewalks over its most sensitive space, its root systems. But it’s not just about protection, if we are to have good public infrastructure and healthy communities to serve future generations, we need to understand that we must put the right tree, in the right place, planted at the right time. And that means a broader variety of native species, not more crape myrtles, and not live oaks planted in small spaces between sidewalks and roads and under power lines. This, too, is foolhardy. Until we become better educated about tree biology and implement policies that protect older trees and guide future plantings, many more will die. And we lose something of ourselves every time. And here’s a picture of a tree killed by development after Katrina, since this article needs a dead tree and I’m not going to use the T-P’s pic. 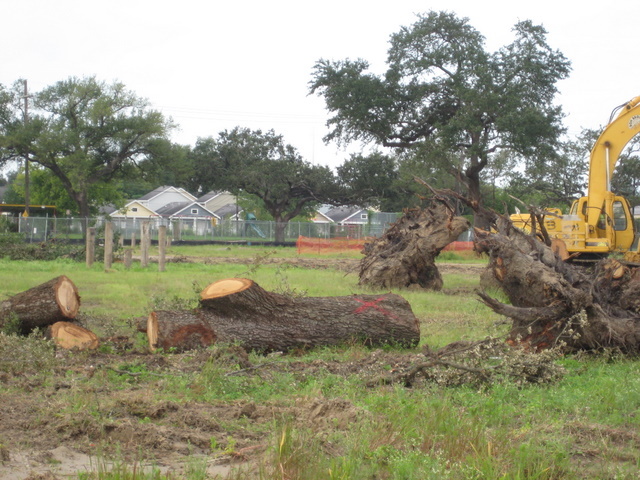 One of the more than 30 mature oaks destroyed by the redevelopment of the Lafitte Projects on Orleans Ave.